The Beantown Bloggery: Slacklining - New Hobby? I had my first encounter with slacklining last week at the Head of the Charles (here). I was walking along the River with some friends browsing through all the food stands that had set up shop and I saw a couple of guys trying to walk on a wobbly tightrope that had been set up between a couple of trees. I didn't think much of it and kept walking. Well apparently, it's a new "sport" that's popped up recently called slacklining. 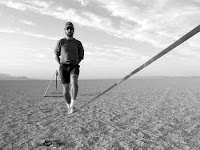 Slacklining is a relatively young sport in which you walk on a "slack" band of flat nylon webbing anchored between two points, usually with slings around trees. Pioneered by West Coast rock climbers in the early '80s, slacklining has been booming in popularity in recent years, particularly on college campuses, and is catching on in Boston. This city's first organized club formed this summer, and its members set up their lines near the Hatch Shell on Sunday afternoons. Seems pretty neat. I bet it helps work your core when you have to balance while walking across the slackline. Click (here) for a link to the Globe article. 0 Response to "Slacklining - New Hobby?"